Opening tonight in Kansas City! Join Laura for a late winter group exhibition of artists who use the character of the urban environment in which they live to build a distinctive personal aesthetic. Weinberger Fine Art presents “Urban Joy” to the Kansas City First Friday audience and will continue the exhibit through March 2019. Works by artists Katrina Revenaugh, Robert Quackenbush, Cynthia Bjorn, Laura Nugent, James Woodfill, Susan Grace, Linda Lighton, Madelline Gallucci and Hunt Slonum are featured in the show. Artists’ remarks will begin at 6:30 PM. The reception is open to the public. Attend the annual fundraiser for the Kansas City Artists Coalition and jump in on the bidding to win an original Laura Nugent work. Laura has donated "Best Laid Plans," a 36" x 60" acrylic on canvas painting which will be auctioned off at KCAC on Saturday, February 16th. Laura will be present that evening as Board President and looks forward to supporting this organization with you. Artful Home, a website featuring wares by many of North America’s finest artists and artisans, is holding its annual online studio sale through February 13, 2019. This year, a selection of paintings by Laura Nugent is included in the sale and may be purchased through the Artful Home website. Don’t miss this once-a-year-opportunity to collect works by Laura at very special sale pricing. Laura has been working at The Bunker since August of this year and is eager to show you the building’s gallery, studios and her “corner office.” The Bunker is an ongoing project which is developing more studio space for artists in the East Crossroads of Kansas City and contributing to the conversation of what will happen next for the creative community here. Questions for Laura or to RSVP, send her a note here. Laura is again participating in the "2018 Kansas City Flat File" which opens Friday, June 8th at the H&R Bloch Artspace in Kansas City, MO. This interactive exhibition will be open to the public through September 29th. A signature Artspace event, the "2018 Kansas City Flat File & Digital File" is the 9th project in this popular biennial series. The Flatfile offers a uniquely intimate art viewing experience and a chance to discover new works by emerging and established Kansas City-based artists. Art lovers are invited to peruse flatfile cabinets filled with over 200 custom-made artist portfolios holding an excitingly diverse range of flat works, and a screening station will feature time-based works included in the Digitalfile. Guest curators will be invited to curate salon walls and queues each month, creating a dynamic and ever-changing experience. Guest curators for June will be Hesse McGraw, principal at el dorado inc. and Alex Priest, public engagement, marketing, and curatorial at el dorado inc.
Laura is exhibiting new work from her "Undiscovered Countries" series at CityArts in Wichita, Kansas. Opening during the Final Friday event on May 25, the exhibition may be viewed from then until June 23rd. From the CityArts website: "CityArts offers people of all ages and cultural backgrounds the opportunity to participate in diverse art programming throughout the year. Since it began in 1998, CityArts has been dedicated to providing education, information and artistic opportunities to all members of the community. CityArts is home to more than 35 professional artists who teach art in Wichita. Each session, these artists engage with students who learn how to create pieces of art in a supportive community setting. Classes are offered in digital arts, photography, fiber, silversmithing, glass fusing, glass blowing, painting, pottery and drawing. Women in the Arts KC is hosting its January gathering at Weinberger Fine Art, following the opening of "Building Blocks," a show featuring the work of Laura Nugent. This event is for all women working in the arts in and around Kansas City. Meet the owner & art advisor of WFA, Kim Weinberger and her staff Courtney Wasson and Jori Cheville. Laura will also be on hand for comments and questions about her new and recent work on exhibit. "Building Blocks," an exhibition featuring the works of Michael C. Driggs, Jeremy Rockwell and Laura Nugent opens Friday January 12th at Weinberger Fine Art in Kansas City. The artists will be present for the reception and each will give remarks about their current studio practice and works chosen for the show. Gallerist and art advisor Kim Weinberger will speak to the theme and how she curated these three diverse artists together for the first time. The show will run from January 11, 2018 - February 24, 2018. Gallery hours are Tuesdays - Fridays, 10 AM - 6 PM and Saturdays 11:00 AM - 5:00 PM. A members event during the Crossroads First Friday is scheduled for Friday, February 2 from 5:00 PM - 8:00 PM. The Arts Company annual January exhibition previewing Of Things To Come in the new year opens January 6 during First Saturday Art Crawl in Downtown Nashville. The exhibit continues through January 25 during regular gallery hours, 11 AM - 5 PM, Tuesday - Saturday. Laura has about a dozen new works featured in this exhibition. The Arts Company is Laura's ongoing representative in Tennessee. Laura's work is included in "Past, Present & Future," an annual group exhibition at JRB Art at the Elms in Oklahoma City. Meant to introduce new and current artists to the community, JRB hosts a brunch opening on New Year's Day from 11:30 AM - 4:00 PM. The show will continue throughout the month of January. Look out for more events with Laura and JRB in the coming year. Opening Reception for "Small Works Show"
Vanessa Lacy Gallery is hosting a winter small works exhibition at the Kansas City Livestock Exchange location. Four works from Laura's "Undiscovered Countries" series will be available for purchase. Please attend the opening reception on December 8 where there will be food, live music and many exhibiting artists in attendance, including Laura. The show will be on display through January 6, 2018. Stop by the ArtsKC Gallery in the Kansas City Crossroads during First Friday for the "Small Works Showcase" featuring 10x10 artwork from KC artists-all priced at $250 or less. This event is free and open to the public. Laura's painting "Rich Vein" (below) is featured in this exhibition. Laura's gallery representative, Costello-Childs, will be featuring her work at Desert Design Day Fall Market in Scottsdale, AZ. Costello-Childs partners with artists from around the US and John Brooks, Inc to serve the contemporary art market in Scottsdale, Salt Lake City, Denver, Aspen and beyond. The 6th Annual KCAC Members exhibition is back by popular demand! "One Night Stand" is a three hour art show in the Kansas City Artists Coalition galleries. Its purpose is for member artists to invite friends and collectors to see and purchase NEW works. Laura's painting "Undiscovered Countries #111," below, will be available for purchase during "One Night Stand." 30% of the sale price will benefit the work of KCAC, Kansas City's oldest arts non-profit organization. Join the party! This is a FREE event with music courtesy of Johnny2tone. Complimentary food and beverage will flow throughout the night. "Undiscovered Countries #111" by Laura Nugent, available for purchase at "One Night Stand." Curious about the various arts organizations in Kansas City and what they can do for you? For the first time ever, representatives from five groups that have helped shape the art community as we know it are sitting on one panel. Come learn how each differs and what opportunities they provide. GEW is the world's largest celebration of the innovators and job creators who launch startups that bring ideas to life, drive economic growth and expand human welfare. One week each November, thousands of events and competitions around the world inspire millions to engage in entrepreneurial activity while connecting them to one another, mentors and even investors. There are more than 150 events taking place in Kansas City to inspire, grow and celebrate your ideas. Visual artist and long time Kansas City Artists Coalition member Laura Nugent, has traveled the art fair circuit, navigates the online art marketplace, licenses her images and sells successfully with galleries around the US. 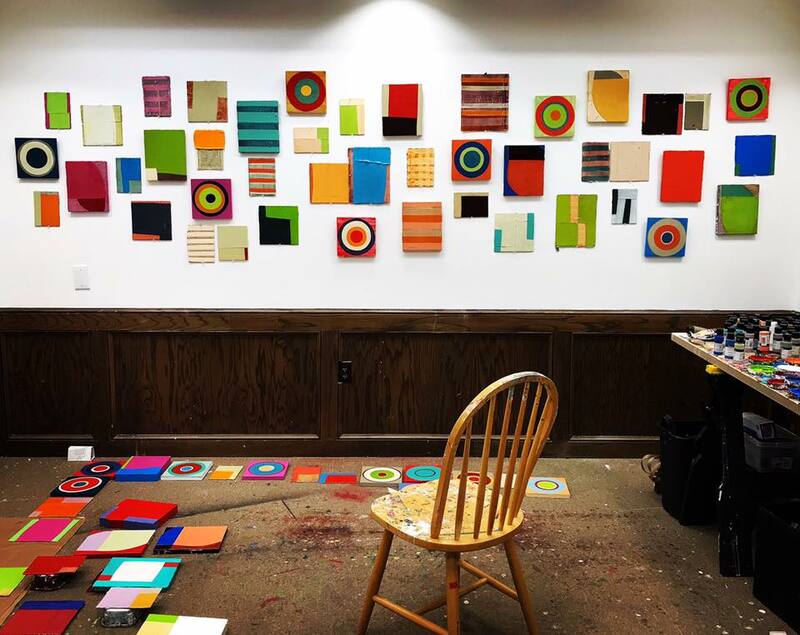 In this "Strategies for Artists" session, Laura will show images from her 20+ year studio practice and exhibition history, describe the evolution of her sales model and demonstrate the importance of making oneself ready for opportunity. RSVP is required! Please contact Marissa at marissakcac@gmail.com or 816-421-5222 to reserve your spot now. Join Laura, along with 240 of her artist friends, this September in Kansas City for the Country Club Plaza Art Fair. This will be her only appearance at an outdoor arts festival in 2017 and her ninth year participating in this highly competitive juried art fair. You will find Laura in booth #223, across from Tivol on Nichols Road. Laura's work is featured in a group exhibition opening August 19 at Roan and Black Contemporary in Saugatuck, MI. The show includes the work of ten Roan and Black artists who work in "graphic and energetic traditions." Click on the slideshow below for more images of "Graphic:Color:Lines." JRB Art at the Elms presents "On The Surface"
Laura Nugent is one of three artists featured in the August exhibition "On the Surface" at JRB Art at Elms Gallery in Oklahoma City. Sixteen new works in Laura's "Undiscovered Countries" series are on display in the gallery's Beaux Arts Room through August 28, 2017. The exhibition will open with a reception from 6:00 - 10:00 PM on August 4th during Paseo Arts Districts's First Friday Gallery Walk. JRB's Gallery Director, Joy Reed Belt, says the show "will feature three very skilled artists whose work often appears to the casual eye to be different than it does under closer scrutiny. Artists Larry Hefner, Behnaz Sohrabian and Laura Nugent will all be present at the opening reception which is free and open to the public." Laura's work is included in the 2017 River Market Regional Exhibition at the Kansas City Artists Coalition this summer. A free, public opening reception will be held on Friday, July 14th from 6 PM - 8:30 PM. The exhibition is on display through September 22nd and will include a symposium featuring the juror, Curlee Raven Holton. As part of the First Saturday, Nashville Art Crawl, you are invited to attend the opening reception of New Works by artists Marilyn Artus and Laura Nugent at The Arts Company, Nashville. Join artists Laura Nugent and Marilyn Artus for a moderated discussion about their careers as artists. This event precedes the July 1st opening of their show at The Arts Company, Nashville. Laura is gifting a painting to support an auction fundraiser for the Kansas City Art Institute student scholarship fund. 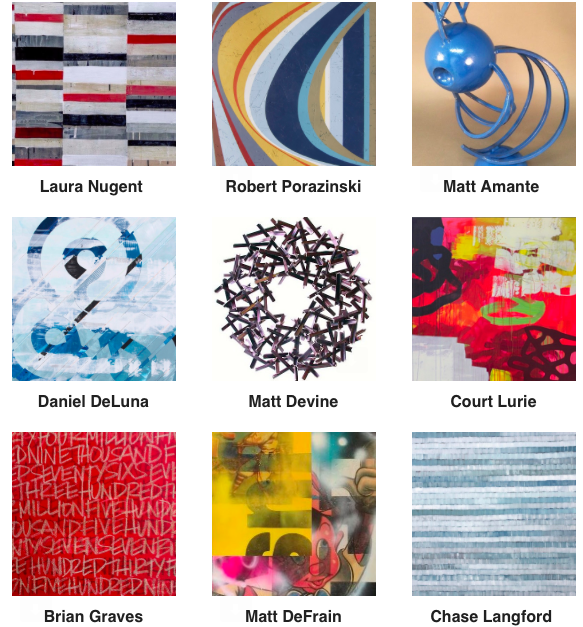 You may attend this benefit in person or bid online through Paddle8. Please visit the event's website for more information and stay tuned here for a preview of the work Laura will be donating. Laura Nugent is showing new and recent works at The Late Show on June 2, 2017. This display includes larger acrylic on canvas paintings and smaller framed works from her "Undiscovered Countries" series. Laura’s exhibit was scheduled and curated by Tom Deatherage, the longtime proprietor of The Late Show, who passed away on May 16. The opening hours are 6 PM - 9 PM on June 2nd. Laura is creating and contributing a work to this biennial art auction gala benefitting the Nerman Museum of Contemporary Art at Johnson County Community College. Stay tuned for an image preview and don't forget to get your tickets. Attend the annual fundraiser for the Kansas City Artists Coalition and jump in on the bidding to win an original Laura Nugent painting. Laura has donated "The Faintest Ink," a 36" x 48" acrylic on canvas work which will be auctioned off at KCAC on Saturday, February 18th. Laura will be present that evening as Auction Chair and looks forward to supporting this organization with you. "The Faintest Ink" acrylic on canvas, 36" x 48"
Filmed over the month of January 2017, watch the segment from KCPT's Arts Upload here.